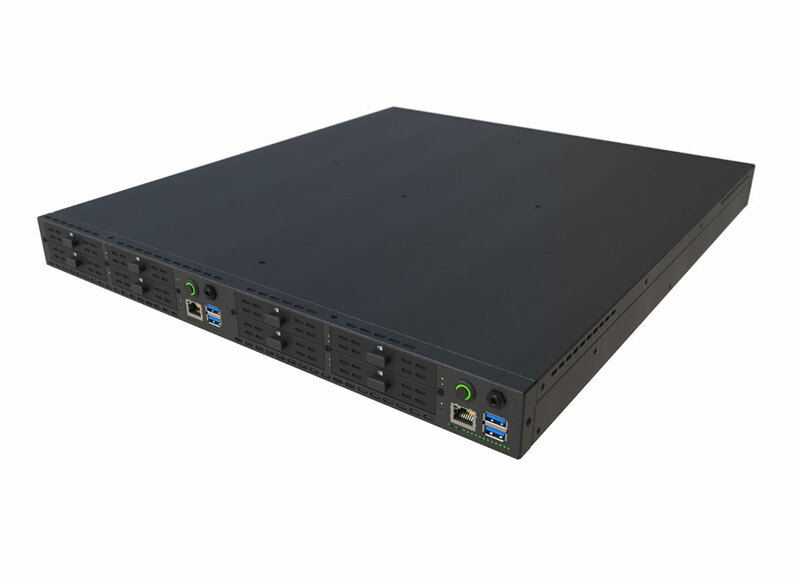 The S1U401-MD “Cyclone” is a unique ultra-rugged, 1U rack-mount, lightweight multi-domain server system with two domains, each with up to 18 CPU cores, dual 10/40 Gigabit Ethernet ports, thirteen 1 Gb Ethernet ports, removable drives, add-in PCIe card, auxiliary power unit (APU) and exceptional I/O flexibility. It is designed to provide two fully independent and isolated high-performance Intel® Xeon® E5 v4 servers, 26 Ethernet ports, dual add-in PCIe cards, as well as two sets of four removable SAS/SATA/NVMe drives—all in a 1U high box. It provides the highest level of server performance possible in a fully ruggedized, convection-cooled system, operating from -20° C to +75° C. Even the AC or DC smart power supplies and optional hold-up APUs are separated to assure full isolation. This system architecture simplifies deployable MIL-SPEC technology for Multiple Independent Levels of Security (MILS), NSA Red/Black network separation, or system redundancy, while integrating processing, storage and high speed I/O in a small, ultra-rugged 1U high rack-mount enclosure with the greatest possible performance per dollar and per watt. The 1U rack-mount S1U401-MD multi-domain Cyclone is two complete (up to) 18 core Xeon® server sub-systems packaged together but electrically isolated, including their separate power supplies and APUs. Cyclone is intended for commercial, industrial, military, defense, and aerospace Red/Black networks that also require storage—such as found on platforms with SIPR/NIPR networks. With the onboard 1, 10 or 40 Gigabit Ethernet ports, Cyclone is an ideal forwardly-deployed vehicle-mounted battlefield multi-domain or dual server that offers double performance or redundancy via the two domains. Alternatively, the S1U401-MD is an ideal airborne network multi-domain server that can also drive operator consoles, such as in an ELINT platform, while recording data and distributing it to multiple Ethernet LANs. The choice of 10 Gb or 40 Gb Ethernet ports provide inter-box LAN connectivity, CPU-based bridging, and multi-node connectivity. Removable drives with optional encryption provide NAS and software-defined storage that scales with system requirements. Multiple add-in processing and I/O modules increase system connectivity and efficiency.